Mad Hatter Top Hat including a multi-coloured Top Hat with attached Hair – Ideal for a Fairy Tale theme, TV & Film theme, or any fancy dress occasion. Make a stand out impression with this Mad Hatter Top Hat no matter what the occasion! This Mad Hatter Top Hat features a Green Large Top Hat with an intricate multi-coloured pattern, and attached Hair for a mad-looking Hat accessory. This Mad Hatter Top Hat features a classic Large Top Hat design, with an intricate Gold leaf pattern with multi-coloured jewel details, and a bright orange sash detail. 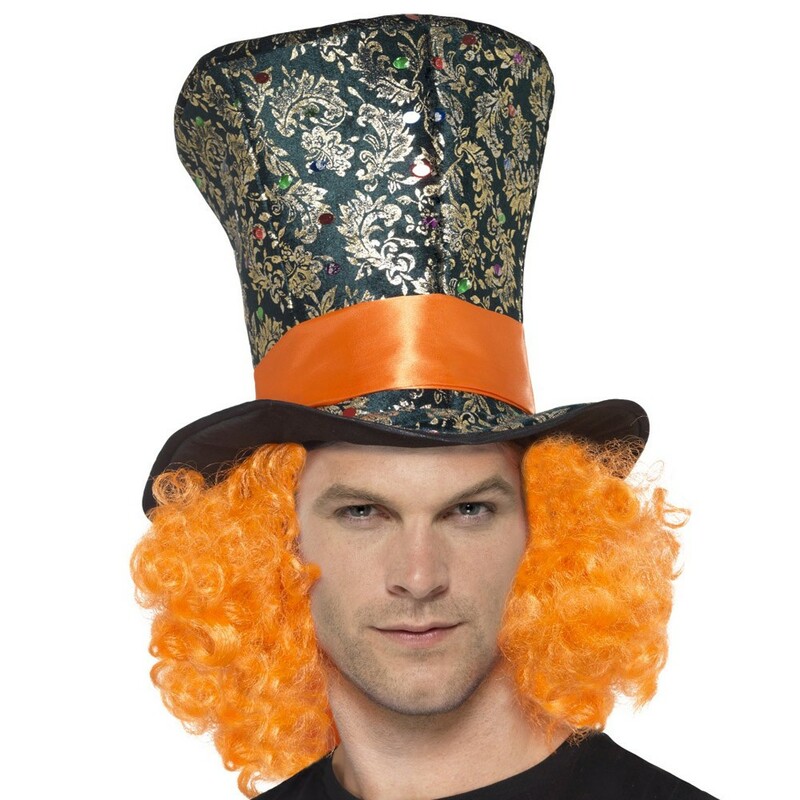 This Mad Hatter Top Hat also includes attached Orange curly Hair for a truly wild looking accessory. The Mad Hatter Top Hat is perfect for a number of occasions, from a Fairy Tale theme to a TV & Film theme. Complete your Fairy Tale look with this fantastic Mad Hatter Top Hat and make sure you are looking dapper! A Mad Hatter Top Hat.